Watercolor (American English) or watercolour (British English; see spelling differences), also aquarelle (French, diminutive of Latin aqua "water"), is a painting method in which the paints are made of pigments suspended in a water-based solution. 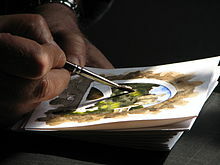 Watercolor refers to both the medium and the resulting artwork. Aquarelles painted with water-soluble colored ink instead of modern water colors are called "aquarellum atramento" (Latin for "aquarelle made with ink") by experts. However, this term has been more and more passing out of use. The traditional and most common support—material to which the paint is applied—for watercolor paintings is paper. Other supports include papyrus, bark papers, plastics, vellum, leather, fabric, wood and canvas. Watercolor paper is often made entirely or partially with cotton. This gives the surface the appropriate texture and minimizes distortion when wet. Watercolors are usually translucent, and appear luminous because the pigments are laid down in a pure form with few fillers obscuring the pigment colors. Watercolors can also be made opaque by adding Chinese white. 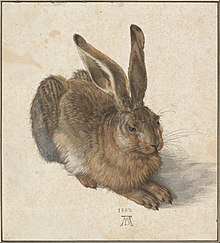 Despite this early start, watercolors were generally used by Baroque easel painters only for sketches, copies or cartoons (full-scale design drawings). Notable early practitioners of watercolor painting were Van Dyck (during his stay in England), Claude Lorrain, Giovanni Benedetto Castiglione, and many Dutch and Flemish artists. However, botanical illustration and wildlife illustration perhaps form the oldest and most important traditions in watercolor painting. Botanical illustrations became popular during the Renaissance, both as hand-tinted woodblock illustrations in books or broadsheets and as tinted ink drawings on vellum or paper. Botanical artists have traditionally been some of the most exacting and accomplished watercolor painters, and even today, watercolors—with their unique ability to summarize, clarify, and idealize in full color—are used to illustrate scientific and museum publications. Wildlife illustration reached its peak in the 19th century with artists such as John James Audubon, and today many naturalist field guides are still illustrated with watercolor paintings. Several factors contributed to the spread of watercolor painting during the 18th century, particularly in England. Among the elite and aristocratic classes, watercolor painting was one of the incidental adornments of a good education; mapmakers, military officers, and engineers used it for its usefulness in depicting properties, terrain, fortifications, field geology, and for illustrating public works or commissioned projects. Watercolor artists were commonly brought with the geological or archaeological expeditions, funded by the Society of Dilettanti (founded in 1733), to document discoveries in the Mediterranean, Asia, and the New World. These expeditions stimulated the demand for topographical painters, who churned out memento paintings of famous sites (and sights) along the Grand Tour to Italy that was undertaken by every fashionable young man of the time. In the late 18th century, the English cleric William Gilpin wrote a series of hugely popular books describing his picturesque journeys throughout rural England, and illustrated them with self-made sentimentalized monochrome watercolors of river valleys, ancient castles, and abandoned churches. This example popularized watercolors as a form of personal tourist journal. The confluence of these cultural, engineering, scientific, tourist, and amateur interests culminated in the celebration and promotion of watercolor as a distinctly English "national art". William Blake published several books of hand-tinted engraved poetry, provided illustrations to Dante's Inferno, and he also experimented with large monotype works in watercolor. Among the many other significant watercolorists of this period were Thomas Gainsborough, John Robert Cozens, Francis Towne, Michael Angelo Rooker, William Pars, Thomas Hearne, and John Warwick Smith. From the late 18th century through the 19th century, the market for printed books and domestic art contributed substantially to the growth of the medium. Watercolors were used as the basic document from which collectible landscape or tourist engravings were developed, and hand-painted watercolor originals or copies of famous paintings contributed to many upper class art portfolios. Satirical broadsides by Thomas Rowlandson, many published by Rudolph Ackermann, were also extremely popular. The three English artists credited with establishing watercolor as an independent, mature painting medium are Paul Sandby (1730–1809), often called the "father of the English watercolor"; Thomas Girtin (1775–1802), who pioneered its use for large format, romantic or picturesque landscape painting; and Joseph Mallord William Turner (1775–1851), who brought watercolor painting to the highest pitch of power and refinement, and created hundreds of superb historical, topographical, architectural, and mythological watercolor paintings. 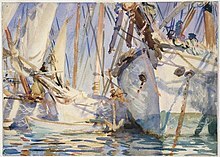 His method of developing the watercolor painting in stages, starting with large, vague color areas established on wet paper, then refining the image through a sequence of washes and glazes, permitted him to produce large numbers of paintings with "workshop efficiency" and made him a multimillionaire, partly by sales from his personal art gallery, the first of its kind. Among the important and highly talented contemporaries of Turner and Girtin were John Varley, John Sell Cotman, Anthony Copley Fielding, Samuel Palmer, William Havell, and Samuel Prout. The Swiss painter Abraham-Louis-Rodolphe Ducros was also widely known for his large format, romantic paintings in watercolor. The confluence of amateur activity, publishing markets, middle class art collecting, and 19th-century technique led to the formation of English watercolor painting societies: the Society of Painters in Water Colours (1804, now known as the Royal Watercolour Society) and the New Water Colour Society (1832, now known as the Royal Institute of Painters in Water Colours). (A Scottish Society of Painters in Water Colour was founded in 1878, now known as the Royal Scottish Society of Painters in Watercolour.) These societies provided annual exhibitions and buyer referrals for many artists. They also engaged in petty status rivalries and aesthetic debates, particularly between advocates of traditional ("transparent") watercolor and the early adopters of the denser color possible with body color or gouache ("opaque" watercolor). The late Georgian and Victorian periods produced the zenith of the British watercolor, among the most impressive 19th-century works on paper, due to artists Turner, Varley, Cotman, David Cox, Peter de Wint, William Henry Hunt, John Frederick Lewis, Myles Birket Foster, Frederick Walker, Thomas Collier, Arthur Melville and many others. In particular, the graceful, lapidary, and atmospheric watercolors ("genre paintings") by Richard Parkes Bonington created an international fad for watercolor painting, especially in England and France in the 1820s. The popularity of watercolors stimulated many innovations, including heavier and more sized wove papers, and brushes (called "pencils") manufactured expressly for watercolor. Watercolor tutorials were first published in this period by Varley, Cox, and others, establishing the step-by-step painting instructions that still characterize the genre today; The Elements of Drawing, a watercolor tutorial by English art critic John Ruskin, has been out of print only once since it was first published in 1857. Commercial brands of watercolor were marketed and paints were packaged in metal tubes or as dry cakes that could be "rubbed out" (dissolved) in studio porcelain or used in portable metal paint boxes in the field. Breakthroughs in chemistry made many new pigments available, including synthetic ultramarine blue, cobalt blue, viridian, cobalt violet, cadmium yellow, aureolin (potassium cobaltinitrite), zinc white, and a wide range of carmine and madder lakes. These pigments, in turn, stimulated a greater use of color with all painting media, but in English watercolors, particularly by the Pre-Raphaelite Brotherhood. Watercolor painting also became popular in the United States during the 19th century; outstanding early practitioners included John James Audubon, as well as early Hudson River School painters such as William H. Bartlett and George Harvey. 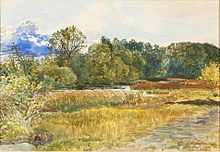 By mid-century, the influence of John Ruskin led to increasing interest in watercolors, particularly the use of a detailed "Ruskinian" style by such artists as John W. Hill Henry, William Trost Richards, Roderick Newman, and Fidelia Bridges. The American Society of Painters in Watercolor (now the American Watercolor Society) was founded in 1866. 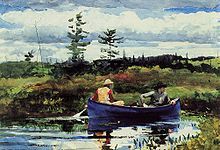 Late-19th-century American exponents of the medium included Thomas Moran, Thomas Eakins, John LaFarge, John Singer Sargent, Childe Hassam, and, preeminently, Winslow Homer. Watercolor was less popular in Continental Europe. In the 18th century, gouache was an important medium for the Italian artists Marco Ricci and Francesco Zuccarelli, whose landscape paintings were widely collected. Gouache was used by a number of artists in France as well. In the 19th century, the influence of the English school helped popularize "transparent" watercolor in France, and it became an important medium for Eugène Delacroix, François Marius Granet, Henri-Joseph Harpignies, and the satirist Honoré Daumier. 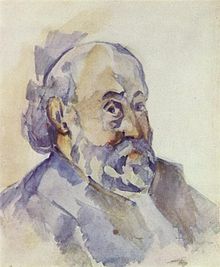 Other European painters who worked frequently in watercolor were Adolph Menzel in Germany and Stanisław Masłowski in Poland. Unfortunately, the careless and excessive adoption of brightly colored, petroleum-derived aniline dyes (and pigments compounded from them), which all fade rapidly on exposure to light, and the efforts to properly conserve the twenty thousand J. M. W. Turner paintings inherited by the British Museum in 1857, led to an examination and negative reevaluation of the permanence of pigments in watercolor. This caused a sharp decline in their status and market value. Nevertheless, isolated practitioners continued to prefer and develop the medium into the 20th century. Gorgeous landscape and maritime watercolors were done by Paul Signac, and Paul Cézanne developed a watercolor painting style consisting entirely of overlapping small glazes of pure color. Among the many 20th-century artists who produced important works in watercolor, Wassily Kandinsky, Emil Nolde, Paul Klee, Egon Schiele, and Raoul Dufy must be mentioned. In America, the major exponents included Charles Burchfield, Edward Hopper, Georgia O'Keeffe, Charles Demuth, and John Marin (80% of his total work is watercolor). In this period, American watercolor painting often imitated European Impressionism and Post-Impressionism, but significant individualism flourished in "regional" styles of watercolor painting from the 1920s to 1940s. In particular, the "Cleveland School" or "Ohio School" of painters centered around the Cleveland Museum of Art, and the California Scene painters were often associated with Hollywood animation studios or the Chouinard Art Institute (now California Institute of the Arts). The California painters exploited their state's varied geography, Mediterranean climate, and "automobility" to reinvigorate the outdoor or "plein air" tradition. The most influential among them were Phil Dike, Millard Sheets, Rex Brandt, Dong Kingman, and Milford Zornes. The California Water Color Society, founded in 1921 and later renamed the National Watercolor Society, sponsored important exhibitions of their work. The largest watercolor in the world at the moment is Building 6 Portrait: Interior. Produced by American artist Barbara Ernst Prey on commission for MASS MoCA, the work can be seen at MASS MoCA's Robert W. Wilson Building. Although the rise of abstract expressionism, and the trivializing influence of amateur painters and advertising- or workshop-influenced painting styles, led to a temporary decline in the popularity of watercolor painting after c. 1950, watercolors continue to be utilized by artists like Martha Burchfield, Joseph Raffael, Andrew Wyeth, Philip Pearlstein, Eric Fischl, Gerhard Richter, Anselm Kiefer, and Francesco Clemente. In Spain, Ceferí Olivé created an innovative style followed by his students, such as Rafael Alonso López-Montero and Francesc Torné Gavaldà. In Mexico, the major exponents are Ignacio Barrios, Edgardo Coghlan, Ángel Mauro, Vicente Mendiola, and Pastor Velázquez. In the Canary Islands, where this pictorial technique has many followers, there are stand-out artists such as Francisco Bonnín Guerín, José Comas Quesada, and Alberto Manrique. Watercolor paint consists of four principal ingredients: a pigment; gum arabic as a binder to hold the pigment in suspension; additives like glycerin, ox gall, honey, and preservatives to alter the viscosity, hiding, durability or color of the pigment and vehicle mixture; and evaporating water, as a solvent used to thin or dilute the paint for application. The more general term watermedia refers to any painting medium that uses water as a solvent and that can be applied with a brush, pen, or sprayer. This includes most inks, watercolors, temperas, caseins, gouaches, and modern acrylic paints. The term "watercolor" refers to paints that use water-soluble, complex carbohydrates as a binder. Originally (in the 16th to 18th centuries), watercolor binders were sugars and/or hide glues, but since the 19th century, the preferred binder is natural gum arabic, with glycerin and/or honey as additives to improve plasticity and solubility of the binder, and with other chemicals added to improve product shelf life. The term "bodycolor" refers to paint that is opaque rather than transparent. It usually refers to opaque watercolor, known as gouache. Modern acrylic paints use a acrylic resin dispersion as a binder. Watercolor painters before the turn of the 18th century had to make paints themselves using pigments purchased from an apothecary or specialized "colorman", and mixing them with gum arabic or some other binder. The earliest commercial paints were small, resinous blocks that had to be wetted and laboriously "rubbed out" in water to obtain a usable color intensity. William Reeves started his business as a colorman around 1766. In 1781, he and his brother, Thomas Reeves, were awarded the Silver Palette of the Society of Arts, for the invention of the moist watercolor paint-cake, a time-saving convenience, introduced in the "golden age" of English watercolor painting. The "cake" was immediately soluble when touched by a wet brush. Modern commercial watercolor paints are available in two forms: tubes or pans. The majority of paints sold today are in collapsible small metal tubes in standard sizes and formulated to a consistency similar to toothpaste by being already mixed with a certain water component. For use, this paste has to be further diluted with water. Pan paints (actually small dried cakes or bars of paint in an open plastic container) are usually sold in two sizes, full pans and half pans. Owing to modern industrial organic chemistry, the variety, saturation, and permanence of artists' colors available today has been vastly improved. Correct and non-toxic primary colors are now present through the introduction of hansa yellow, phthalo blue and quinacridone (PV 122). From such a set of three colors, in principle all others can be mixed, as in a classical technique no white is used. The modern development of pigments was not driven by artistic demand. The art materials industry is too small to exert any market leverage on global dye or pigment manufacture. With rare exceptions such as aureolin, all modern watercolor paints utilize pigments that have a wider industrial use. Paint manufacturers buy, by industrial standards very small, supplies of these pigments, mill them with the vehicle, solvent, and additives, and package them. The milling process with inorganic pigments, in more expensive brands, reduces the particle size to improve the color flow when the paint is applied with water. In the partisan debates of the 19th-century English art world, gouache was emphatically contrasted to traditional watercolors and denigrated for its high hiding power or lack of "transparency"; "transparent" watercolors were exalted. The aversion against opaque paint had its origin in the fact that well into the nineteenth century lead white was used to increase the covering quality, which pigment tended to soon discolor into black under the influence of sulphurous air pollution, totally ruining the artwork. The traditional claim that "transparent" watercolors gain "luminosity" because they function like a pane of stained glass laid on paper—the color intensified because the light passes through the pigment, reflects from the paper, and passes a second time through the pigment on its way to the viewer—is false: watercolor paints typically do not form a cohesive paint layer, as do acrylic or oil paints, but simply scatter pigment particles randomly across the paper surface; the transparency consists in the paper being directly visible between the particles. Watercolors appear more vivid than acrylics or oils because the pigments are laid down in a more pure form with no or fewer fillers (such as kaolin) obscuring the pigment colors. Furthermore, typically most or all of the gum binder will be absorbed by the paper, preventing it from changing the visibility of the pigment. The gum being absorbed does not decrease but increase the adhesion of the pigment to the paper, as its particles will then more easily penetrate the fibres. In fact, an important function of the gum is to facilitate the "lifting" (removal) of the color, should the artist want to create a lighter spot in a painted area. Furthermore, the gum prevents a flocculation of the pigment particles. ^ Roger Ling (1991): Roman Painting. Cambridge University Press. ^ Ellis Kirkham Waterhouse (1994): Painting in Britain - 1530 to 1790. Yale University Press. ^ "Watercolor Painting in Britain, 1750–1850". www.metmuseum.org. Retrieved 2018-10-03. ^ Vloothuis, Johannes (2017-07-14). "Understanding the Different Grades of Watercolor Paper". Artists Network. Retrieved 2018-10-03. 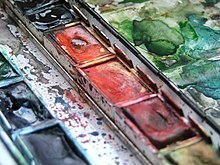 ^ "Watercolor Paper: How to Choose the Right Paper for Use with Watercolors". Art is Fun. Archived from the original on 2015-10-07. Retrieved 2015-10-06. ^ "THE COLLECTOR'S GUIDE: WHAT IS WATERCOLOR?". www.collectorsguide.com. ^ Brown, David Blayney. "Watercolour." Grove Art Online. Oxford Art Online. Oxford University Press. Retrieved April 26, 2014. ^ Nalewicki, Jennifer. "The Story Behind the World's Largest Watercolor Painting". Smithsonian. Retrieved 2018-07-01. ^ "The World's Largest Watercolor Goes on Display at MASS MoCA". Creators. 2017-05-30. Retrieved 2018-07-01. ^ "Barbara Ernst Prey Building 6 Portrait: Interior". MASS MoCA. Retrieved 2018-07-01. Wikimedia Commons has media related to Watercolor painting. "Watercolour Painting". Paintings & Drawings. Victoria and Albert Museum. Retrieved 2007-08-21.